The Rick Brunetto Big Band delivers a wide variety of musical entertainment to your wedding day. The orchestra is an institution in Columbus Ohio with almost 30 years of performance experience. The band will make your special day an unforgettable experience for you, your family, and guests. You will hear many of central Ohio’s finest professional musicians in one, powerful orchestra playing the music you love the way it is supposed to be played at your wedding. The show will be scaled to the size of your wedding and budget. No matter if you have 50 or 500 guests, you are getting a customized unique experience in an affordable package. Do you play any modern songs? With a big band anything is possible! We perform a variety of music so everyone can enjoy the party. Our orchestra plays a wide selection of virtually all eras from the swinging big band years to Earth Wind and Fire, Chicago and the Motown years. We are prepared to bring two or three singers to cover anything from classic show tunes to the current sound of Bruno Mars, Katy Perry, Michael Buble and everything in between. Have you thought of a musical theme and era for your wedding? Ask for our Vegas-style show, or the spot-on Sinatra and the Rat pack package, or even a Motown night. Our wedding song selection comes from an excessive music library/ When we say excessive, we mean it! Our charts literally fill up a basement. Still, if your heart desires something we never played before please ask us before hand. We are always ready to hunt down and play new songs. Guess how we filled up that basement in the first place?! Rick will work closely with you selecting the songs for your first dance as a married couple, father-daughter dance, mother-son dance, and any other special dances you may desire. Our dance song library will be presented for you and we are available to assist you in the choices. We are talking about a huge band, is it affordable? Our goal is not to present a fancy concert, but to keep the focus on the personal experience. How do we scale and balance the entertainment for your needs and budget? Here are a few options how to tailor the event for the size of the venue, to your taste and needs. When do you want us to play? One of the options is a solo pianist for the cocktail hour. We can provide a 3 or 4 piece jazz combo for the dinner. Both are excellent choices for sophisticated background music, but pre-recorded music is available as well. How long do you need us to play? For the wedding reception the full 18 piece orchestra can keep your guests on the dance floor for a couple of hours or until the wee hours. Do you have special effects in your mind? We always come with professional sound and lighting for the performance area. In addition we can also bring lighting and special effects for the dance floor if it is desired. Depending on your needs, we can customize not only the musical style but also work with you to add special fun for the special night. Do you have something in mind? Karaoke? A cowbell competition? Always wanted to direct an orchestra? Is there a song you want to hear for the line dancing you plan? Please let us know your ideas so we can come prepared. Guests like to know what is going on next and why. This is why we offer for you emcee (master of ceremonies) services at no extra charge. If you opt for this, then we’ll do the announcing of the grand entrance, toasts, special dances, cake cutting, bouquet toss or other special events you plan. We work with you to keep things on track. We are coming prepared every time for every wedding and will provide wireless microphones for speeches, toasts and blessings. We will coordinate with your caterer, photographer, videographer, choreographer, and other vendors about the timing and synchronization of all your unforgettable moments. We are prepared to play pre-recorded music during introductions, special events and when the band takes a break. You can pick the songs, artists or the style or just let us do it. You will get access to our catalog of pre-recorded music beforehand. We have hundreds of the most requested wedding songs in our library. But again, we don’t mind buying a couple new ones if we don’t have it yet, which means you won’t need to track those down. If you think about using your iPod or a dude behind a laptop, then please think again. Does your wedding cake come from the grocery store? Do you want a photographer taking wedding pictures with his phone? So, on this special day, do you really want to hear the same songs in the same way everyone heard on the radio a million times before? Nothing comes close, nothing is even in the neighborhood of the fun and the overwhelming energy of a full size big band orchestra playing a live concert at your wedding. And this show is presented to you, the bride and groom. 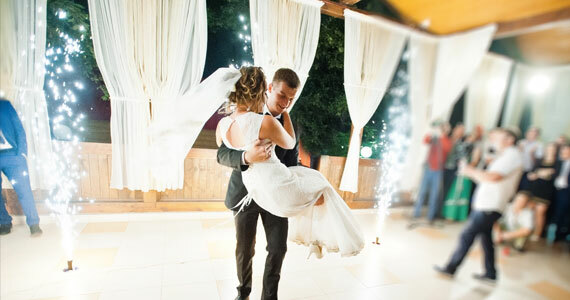 If you want to have your very first dance on the clouds as a married couple, please call us at 614-419-5076 or contact us.